Want!! 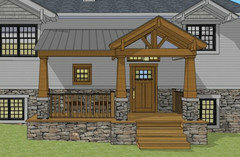 Craftsman style Front Porch on my builder grade box!! Just bought this house in northern MN. 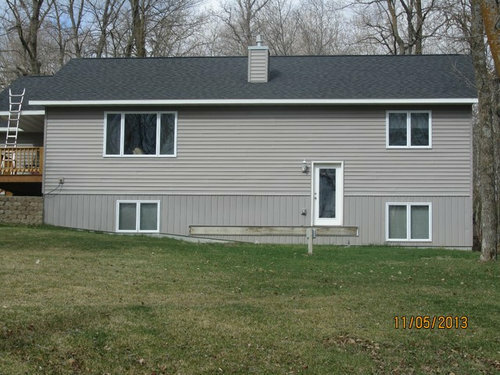 As you can see, the previous owners didn't go with a porch on this newly built home. The leader board is there and nothing else. Most folks in around here would add a deck..I DO NOT WANT A DECK ON THE FRONT OF MY HOUSE!!! What do you think? Would it be possible to put a covered craftsman style front porch on this builder grade box? 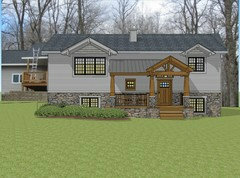 I realize we will need an architect/draftsman for plans; but welcome ideas and feedback. @sstar...yes..it really is...Just wondering if it would balance it better- along with a wider door/wider window trim! What program do u use? I need to get something!! I love all the suggestions! 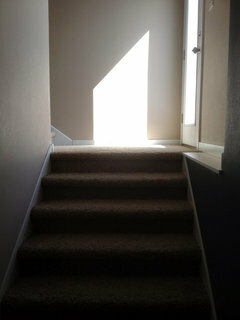 Moving the door would require extending the landing and stairs to the lower level. 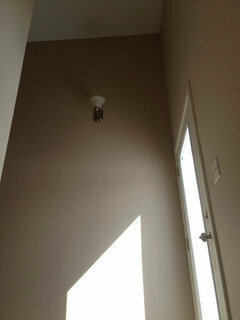 I'm attaching a photo looking up to the landing, it is quite small. What would work easier is another window, as mentioned. I realize I can't turn this into a true craftsman, but I so love that style and think bringing elements of it would not be inappropriate.This is what we can afford, and it will be our 'forever' home; so I want to add character and function, and something that I will enjoy driving up to for the rest of my life. All without doing a massive (subjective) reconfiguration. Not too much to ask, eh? I love cedar shingles, but not sure adding them to the entire house is an option right now. Accents here and there (but where?) might be all we can do. I welcome all your suggestions, and am overwhelmed (and overjoyed) at the options you have all presented. We move in on the 14th, I will try to get measurements before then. @jimsnurse...I hear u..I love Craftsman!! Curious to hear about casemgmt from home...is it for a local company? I have been licensed (originally in MN) since 1996...getting tired of on the floor. jimsnurse1@yahoo.com. Jayme, I work for BCBS of Florida. I started with them back in 2006 while we lived in Tampa for a while. And they allowed me to keep my WAH position when we moved back to MN. We can visit more via email if you like. 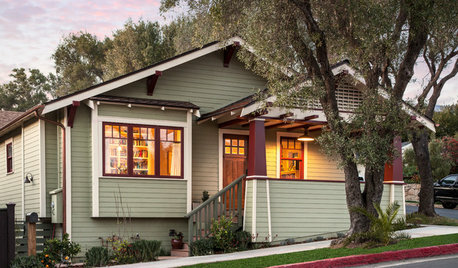 Let me ask this, for all of you: Putting aside my preferences for Craftsman style; if you were approached with this 'plain Jane' house, what would YOU suggest? Maybe I need to look at ALL options. And secondly, approximately what do you think it will cost to get a design/plans? Are we talking hundreds of dollars? Or more than $1000? Right jimsnurse, I'm taking off the shingles and will add the window you mentioned. If it were my house, I would take it in either a modern direction (that's just my sensibility), or go in the northwoods/lodge/craftsman direction (kind of what we've been mulling). Cost of plans depends a great deal on who you hire. You have to decide how much you trust your own concept, and what would be sensible to pay, based on the value of your house. If you hire someone to rethink your entire concept, check out their work first to see whether you like it. Since you plan to stay here, trust your gut. 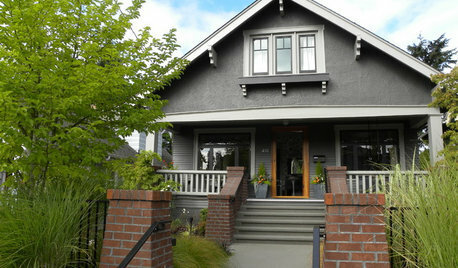 If it were me, I would continue with the portico/porch idea vs more extensive changes. I would look at adding more substantial trim to the windows & door..and a sidelight if able...possibly an alternate siding on lower half of home. But if you want to make large, structural changes...ie: tie into roofline, change windows...those changes would undoubtedly be more extensive and expensive. -Some lumberyards have people who draw up plans for you if you are buying materials through them...I am not sure if they charge or not..if they do, I am thinking it likely would be reasonable. -I know builders often have staff to do plans too..so if you hire the project done, it may be worked into the bid. -I am not experienced with architectural charges. Go by what's best for you and your budget. My husband can build what I design so I am sort of a different case..and if it looks bad, it's my own fault..but I have been happy with my projects. Also, do not forget the impact of landscaping...it adds a lot to the appearance of homes. Actually jimsnurse, do you use Sketchup? If you get measurements, I'll redo the file and send it to you. A close up of the pic of the house I posted a ways back...there r some similarities to your home...add on the different materials on lower half..a portico (although smaller one on this home than yours would likely end up to be)...and nice landscaping. Here's the entrance, with craftsman hanging lantern, head light, new hall window, subtle paint. 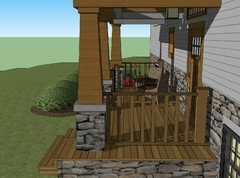 Great stuff Sstarr, can you add the porch extension as sketched by catieb a few posts back? We can't go under the windows on the bottom with decking because excavation would be needed. But I like how the porch roofs are done in the sketch. I did download the trial version of sketch up, and find the tutorials and capabilities amazing! But I don't think I will ever be proficient in it. Can the trial version accept files? @jimsnurse...a little extension may do the trick..or a wider portico/porch more centered under upper level windows? -Or how about a pergola off the portico? -I agree with u about sketch up!! 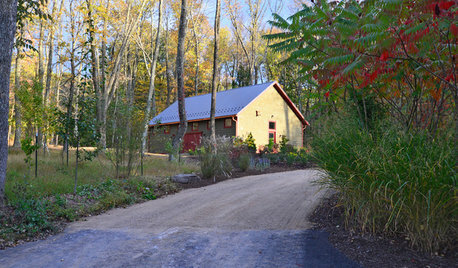 Found this pic...they extended a covered area with a shed roof along front of house..this one isn't attached to portico. On behalf of jimsnurse, Nice work, all. Given that this house is a split level, it is tough to make the roof elements look in place and proportionate. I hope the owner is happy, as the have encited a mini charrettte of exterior design. sstarr93 and caleb. I think it is also important to delineate the function--ornate only, or with seating? Also, this work represents a significant change in bldg. footprint, so make certain that the home owner's understand their responsibilities, regarding land use, building codes and permitting, should they heed your attractive advice and move forward. Also please consider the glassed-in portal, that would be really practical in northern MN. To:DMH DESIGN, are you the moderator of this site? I have been so impressed with the positive feedback and assistance I have received from the posters here; but should have known there would eventually be some Negative. Anyway, I will continue to be grateful for the generosity of ideas that have been shared by others; specifically Jayme, sstarr93, and catieb. We absolutely will use this porch, but even you must admit it needs a face lift so I won't deny that it is also about aesthetics. My husband and I have added a porch to a previous home, and are quite familiar with the process (permits---if needed---along with environmental and functional concerns) but back then (15 years ago) we didn't have the luxury of exploring on the Internet first. 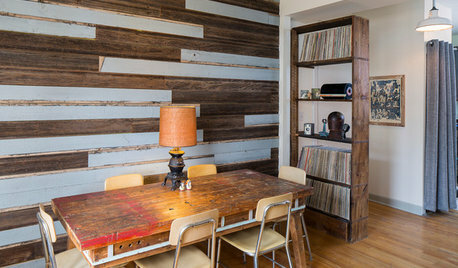 Regardless, a design/plan will be obtained as this isn't an episode of Renovation Realities! You start your post 'On behalf of' which I always interpreted to mean that you were 'speaking for' someone. But I might be wrong about that too. jimsnurse. I think you misunderstand. DMH, who often has a design betterment, has instead given (deserved) kudos to your team, and is only adding a professionally responsible advisement, so your ducks stay in a row as you proceed. Your thread has been and continues to be filled with none but positive support. I hope you will post your results; I have enjoyed following, and look forward to your reveal. Hi jimsnurse! I'll get the railings done in a bit..... and perhaps put the metal roofing on. Thanks studio10001--Yes to jimsnurse, I was applauding and lauding the efforts of others. Very few posts garner the kind of attention that yours has. Great ideas. I would have contributed one myself, but the graphic representations you had already received were quite effective. Nothing I said was intended to directly or indirectly impune anyone's input or owner responsibility. 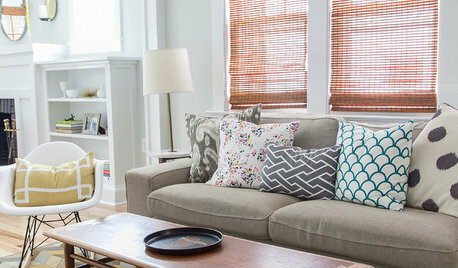 I should have stated "on behalf of fellow Houzzers.." For that, if offense was taken, please accept my apology. I second @DMH Design; getting collaborative design from peers can lead to some great solutions as it has here, but technical and legal issues currently not in the discussion may preclude these solutions. That's what pros are for. @jimsnurse, think of an Architect not just a draftsman or even a designer, but as your overall building advocate. The sooner one is on board with you, the better your creative endeavors will be guided toward a realizable solution. Great suggestions. Maybe you have already considered this.....but I would look at alleviating the boxiness of the house by adding some dimensional elements...sweeping curve from one end of the house that arches at the roof and centered above the door. It seems to me you should address the front as a whole and not just one part. Tudor inspirations, modified. With this landscaped nicely...this could really look wonderful..and also could be accomplished without tearing up the roof line of a new home. sstar93--I like the direction that you and catieb (can't spell, sorry) have taken this. Your efforts have been fun to watch in development. What program? Sketch Up or?? Let me clarify: i never imagined I would get the response that I did and am still giddy with the possibilities. But, as I mentioned, this is our forever home. We are impressed and appreciative of the designs and suggestions offered here; but our intention is and always was to include a professional and to do this correctly. I am a nurse and my husband is a truck driver; I know what I like and he makes it happen (within budget and reason). We need the plans of course, but this porch will mostly be built by him and our friends and family. We are not wealthy, and need to be mindful of cost. To be able to see the potential virtually is incredible, and all without writing a check (that will come soon enough). I respect the livelihood of the architects and draftsman that may be contributing to this post and in no way expect to figure this renovation out by the comments on my iPad. Thank you, thank you EVERYONE; this has been delightful. 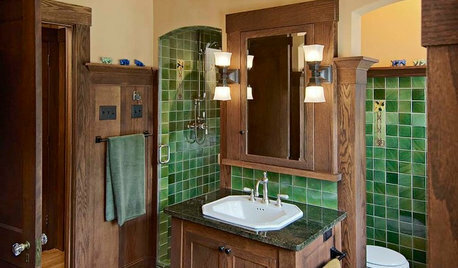 And yes, I will bring back photos to HOUZZ. Pa P, I see what you mean. Somehow we will have to tie in what is done in the front to the sides and around back. We hopefully will be able to do this in stages; which means our plans will have to be inclusive of what we would like the end result to be. Personally, I think you are addressing the front as a whole by the size/scale of the portico/porch...adding in the small window, etc....also by considering adding lower level alternate siding, wider window and door trim, etc. The view down the porch with chairs, and with your background. Thehome's current roofline/window orientation is a little different...true windows sit higher, but this does give a nice idea!! It could look this way with alterations to roofline. Thank you sstar..just an observation, not at all a criticism..you have done a lot of work!! It looks great!! @sstar..I figured the gables had something to do with it...it looks wonderful! 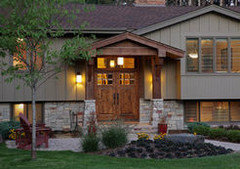 If you are looking for quality stone veneer for either interior or exterior projects check out www.CenturionStoneMidwest.com. They stock every stone in every color & pattern shown on their website to make it easy and quick to get the stone you want. Sstarr, it does look wonderful! New (and bigger) windows are something i want to replace down the line. Love what you've done with the roof line. Somehow, I'd like to eventually connect the side porch to the front and around the other side. Not necessarily with a structure, but with landscaping and paths. Yes, the side porch has a lot of potential. Are the steps on the far side? You could do steps..down..flagstone (into the ground), or something...and do a flagstone area near the front of the house and incorporate it into a patio like area. Steps aren't on the far side but rather on the west side facing driveway. That's good, so the flow can wrap around from the front to the side. Is that area in front of the retaining wall where you were considering a stone patio? Haven't thought much about the 'how and what' aspect yet; just think eventually everything must somehow cohere. Love love love bungalows! Have fun with this!! 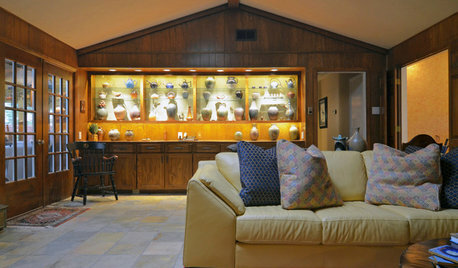 I might do the same to our ranch style home! sstarr93.....nice job on the rendering. Thanks! jimsnurse, there are many details and several code issues to be addressed from this point on, but I hope you feel as if you have some good ideas as a starting point to work with an architect or designer and engineer. Great thread! 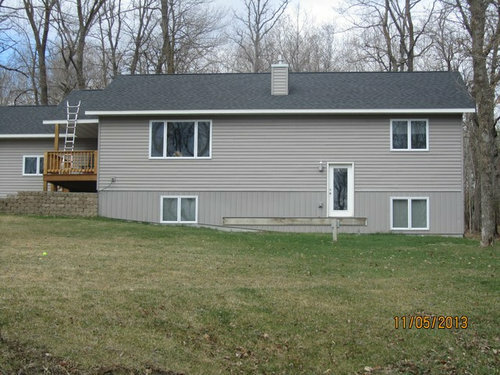 I also just bought a pretty plain split level similar to yours. My plans are similar to yours-- add a roof over front door, stone bottomed columns, stone vaneer on the bottom wall, etc. I also like how facades/gables over windows add interest to the roofline, but after researching on the cost, I decided to opt out of that. Have fun and hope to see your "After" pictures! 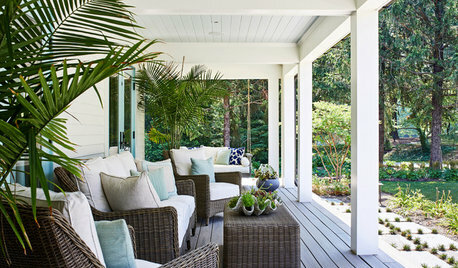 Sstarr and catieb I love your porch ideas. I would love it if you would take a look at my dilemma. sstarr93 would you have a 3D sketch up model of that porch I could use? I modeled my house in sketch up and can't figure out what to do for a porch. I love this one you designed, and would like to try it on my model! Wow- a lot of great comments and ideas here. What a talented group. It's been a while since this was first posted, just wondering if you were able to complete it? Sara smoker, sure, I keep all design files. I will look at this tonight, and if you leave a comment on my idea book, with email address, I will contact you. sstarr, you did well w/ the OPs problem; I like the window change, too. All: did anyone notice the ladder is doing a "handstand"? I think it's upside down. lol. Kudos to catieb for the design here! 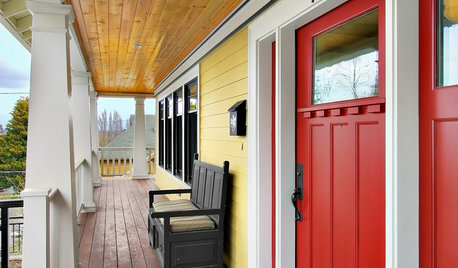 Want to upgrade the looks of my front porch with new door & screen door. 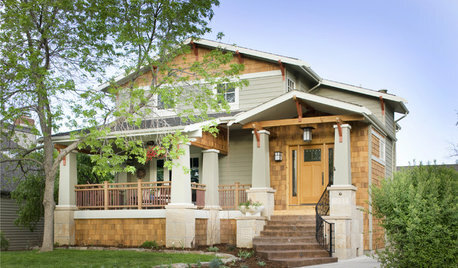 Column suggestions for craftsman style home? 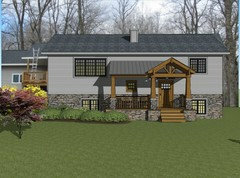 Want a Craftsman Cottagy kind of Home...what materials could I use?